The Zambezi National Park in North Western Zimbabwe is renowned for its elephant populations. It has been amazing to watch how the elephants in the Park have become extremely relaxed around the Lodges that have been established in the area. On 27th March, a large group came wandering through Victoria Falls River Lodge to en-route to one of their favourite drinking and wallowing spots. Whilst enjoying the opportunity to witness the interaction between herd members at close quarters, it was noticed that a young bull (in his early to mid 20’s) had a wire cable hanging loosely around his neck. The setting of cable snares on the islands in the Zambezi River, in an attempt to catch hippo or buffalo that frequent these islands, has long been a problem. 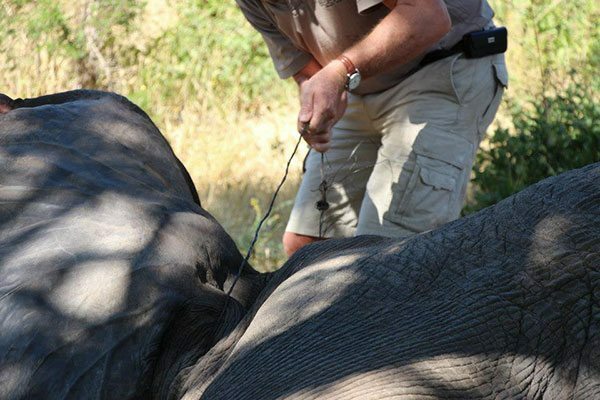 Fortunately in this particular instance the elephant had managed to tear the cable away from its moorings without the snare being pulled tight around his throat. 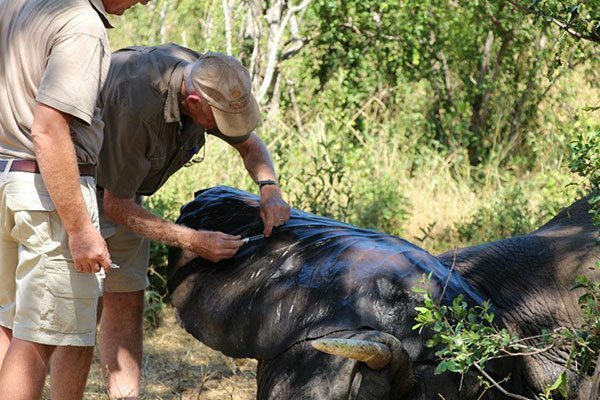 Management contacted the Victoria Falls resident wildlife darting expert, Roger Parry who, along with veterinarian Dr. Chris Foggin and a member of the Parks and Wildlife Authority, set out immediately to come to our aid. 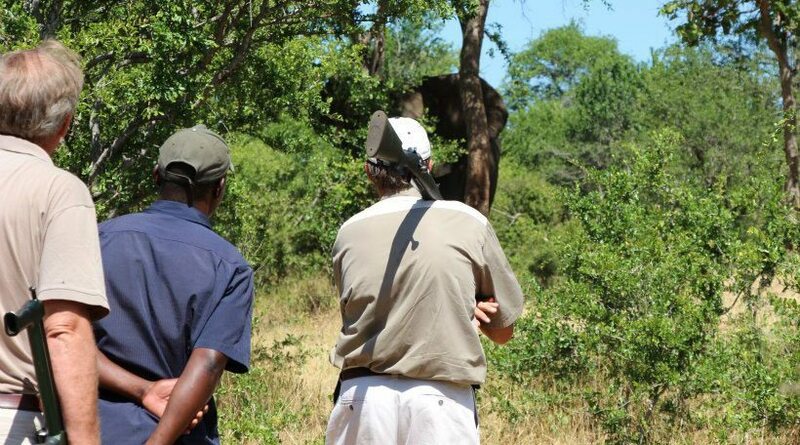 The elephant was resting in the shade under some large Diospyros trees behind the Lodge, close to the Victoria Falls game-viewing platform. Using the steps of the platform as cover, the party was able to get close enough to him to dart him and within a few minutes, he was fast asleep and they were able to get to work. Elephants flap their ears in order to regulate body heat. This flapping motion allows cool air to pass over large, thinly covered, blood vessels behind their ears. When an elephant has been darted however, it is unable to flap its ears to facilitate cooling – so it is vital to prevent it from over-heating by artificial methods. A knapsack sprayer turned out to do very good job indeed! 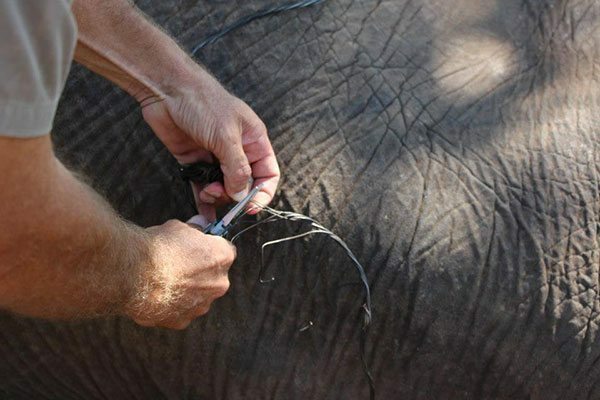 Once the snare had been removed, blood samples were taken. 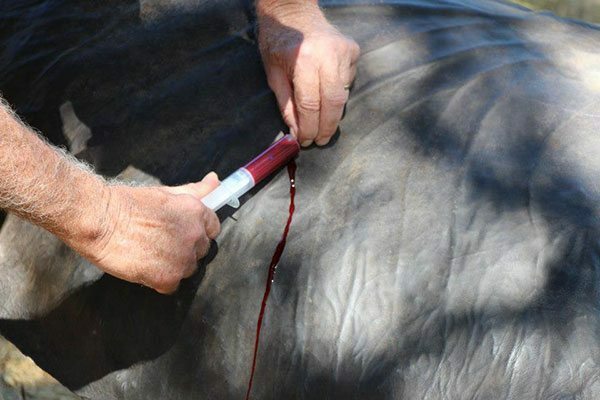 This is done with all darted animals in order to compile a blood profile and check for any blood-borne parasites. 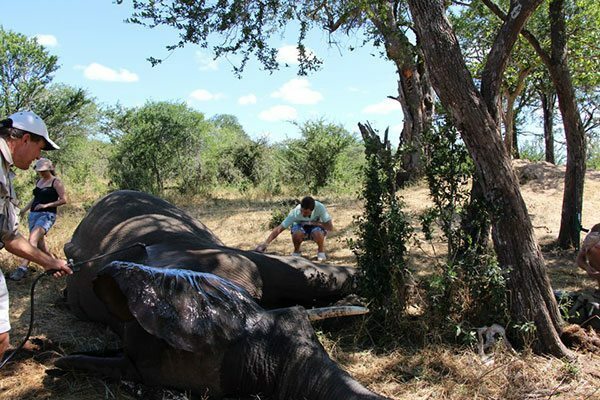 The large blood vessels under the thin skin behind the elephant’s ears offered the perfect site for such tests to be performed. 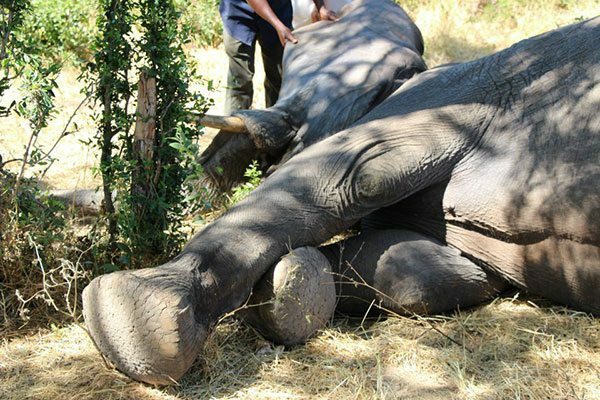 Once everything was done, the elephant was injected with an antidote to reverse the sedative. Retreating to a safe distance the Team watched as he got back up on his feet and regained his composure. He had been down on the ground for no more than 20 to 30 minutes. After glaring at the team for a few seconds, the bull wandered off and re-joined the herd, which had been waiting patiently not far off. It is always so wonderful to be able to be actively involved in the conservation of our wildlife heritage; something for which we are all equally responsible. As a key stakeholder, situated in the heart of the Zambezi National Park, Zambezi Crescent is committed to a leading role in this conservation effort.